The 22nd of July is the Feast of Mary Magdalene and, if you don’t mind, I would like to indulge in some unorthodox and esoteric investigation about the ‘other goddess’. If you are particularly attached to one of the traditional stories about Mary Magdalene or the story of a goddess or the divine feminine – please be aware that I am going to go to some alternative and strange territories for the sake of curiosity and investigating possible truths. Some of them might sound strange but as Elaine Pagels wisely noted in The Gnostic Gospels, so are the scriptural stories in all major religions – except that we are just accustomed to them. Mary Magdalene is a source of fascination for me, as I am deeply convinced that we lack an intelligent and truthful representation of the divine feminine. Many of us feel that the Virgin Mary, who is albeit very conspicuous, especially in Catholicism, is primarily a misappropriated male fantasy of the ‘all-loving’ mother. The fascination with Mary Magdalene, on the other hand, is nothing more than the search for her true story, whatever it might be, in the Western tradition. Many scholars, mystics and intuitives feel that there is much more to her story that we are led to believe. 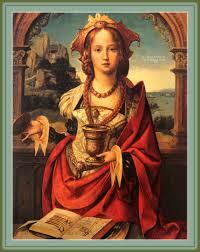 Usually, I honour Mary Magdalene as a disciple of Jesus as she is portrayed by the Gnostic Gospels. This blog, however, intends to look at some of the more alternative ‘explanations’. Joseph Campbell, for example, points out that there has always been more to the archetype of a goddess than viewing her as Mother Earth. And, like many scholars and researchers, he turned his attention to the Sumerian story of creation. There are some good reasons. 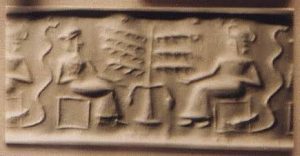 Firstly, this story is where the Biblical version with Adam and Eve, the snake and the tree comes from — but with a completely different interpretation (Sumeria, by the way, is known as the oldest human civilisation, having started around 4000 BC and thus predating Biblical stories). Secondly, it is also where the Goddess is truly predominant and powerful, in contrast to where, again, the later traditions (including the Biblical tradition) reversed or repressed the status of the Goddess. In Sumeria, Campbell says, the Goddess was much more than Mother Earth. She was the Cosmic Goddess and she created both the gods and us as her children. Campbell gives a wonderful example of some artefacts from Sumeria. One, a sculpture, portrays the Goddess Ninmah with a snake behind her as she sits in front of the Tree of Life with her hand extended towards the Tree; on the other side of the Tree sits another god in the same position but without a snake, as Ninmah passes him the Fruit of Life. There is no ‘Fall’ in this story, as Campbell says. The Goddess is not only offering the other god the Fruit of Life but also a refreshment of Energy. The god has horns, which in mythology symbolises the reflective light of the Moon and Resurrection. Thus, by passing him the Fruit of Life, the Goddess offers him new life or Resurrection. 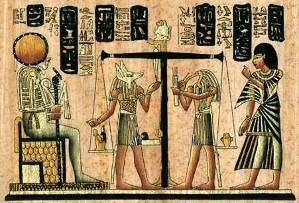 The same basic story is repeated in the Babylonian and Egyptian mythologies/religions — which were also taken from the original Sumerian story. In Babylon the Goddess is called Ishtar, and in Egypt — Isis, also known as ‘The Queen of Heavens’. The Babylonian and Egyptian stories repeat the same plot: of a goddess resurrecting a god through the gift of Life. There is no sin, there is no female guile or mischief. That was not introduced until much later versions which repeated the Sumerian story but made the snake the tempter and the life-giving Goddess into a not-so-bright Eve. (There are some fascinating explanations for the Tree of Life and the snake, but these are perhaps for another blog altogether). 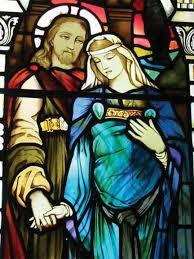 Now, what does this have to do with Mary Magdalene and the Dark Madonnas? Well, to start with, in all cases the goddess was referred to as ‘dark’. And if we want to go even deeper into this, so, apparently, was the Queen Sheba, who was called ‘dark and comely’. Each time, the Goddess was involved with giving life to, or resurrecting, a young god. This is where Margaret Starbird, who is a very devout Christian, comes in. Starbird was puzzled by the story of the virgin birth and the absence of the feminine in Jesus’ life and Christianity (apart from the rather strange story of the virgin birth). She found the story of the ‘virgin son’ born of a ‘virgin mother’ somewhat unreliable and directed her suspicions towards the removal of both the feminine and sexuality from our belief system. In her research, she found that in ancient times both the feminine and sexuality were considered sacred. 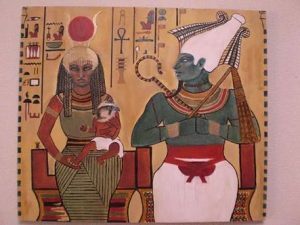 She also discovered the ancient ritual of Hieros Gamos (Sacred Marriage) anointing of the young god/king by his goddess/bride before their marriage. Later, the goddess/bride in these ancient stories also resurrects the groom/god after he has been sacrificed. Being a Biblical scholar, Starbird could not help but see similarities here with the story of Jesus and Mary Magdalene, albeit with the latter having been significantly edited out at some stage. In her famous book, The Woman with the Alabaster Jar, Starbird argues that Mary Magdalene was not named so because she came from the town of Magdala but rather her name was originally Mary Magdalen (Magdaler in Hebrew scripture means the ‘Tower’ or the ‘Daughter of Jerusalem’). Author and independent researcher Glenn Bogue also argues that Magdala may not even have existed in Jesus’ time, and thus Mary Magdalene could not have been Mary of Magdala. Starbird concludes, as per St. Bernard’s of Clairvaux (11th-12th century influential saint who outlined the rules of the Order of the Knights Templar) suggestion, that Mary Magdalen was the same as Mary of Bethany, who, like goddesses from earlier traditions, anointed a god before their marriage. Starbird also believes that all evidence suggests the marriage in Cana where Jesus turned water into wine was actually his own marriage to Mary Magdalen. This then repeats the story of a goddess and a god, their marriage and the god’s resurrection (since she was the first to see him after). Both Starbird and Bogue also make a connection with the mysterious ‘Dark Madonna’, who appeared in Europe around the 12th century, right after the French ‘heretics’ known as the Cathars were killed off. The Cathars happened to be viewed as heretics for several reasons, one of them being that they believed Mary Magdalen/Magdalene was Jesus’ wife and bore him a child — a dark-skinned girl called Sara. Starbird, Bogue and many others believe that the Dark Madonna doesn’t represent the Virgin Mary but instead is Mary Magdalen/Magdalene — the other, dark goddess. 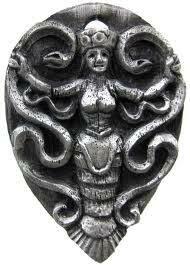 She was a bearer of the more ancient tradition of the Cosmic Dark Goddess, dating back to the Sumerian creation story with the Dark Goddess at its centre. Indeed, both Starbird and Bogue believe that some of the greatest artists, such as Da Vinci and Botticelli, honoured the Cosmic Goddess by hiding her symbols in their paintings. 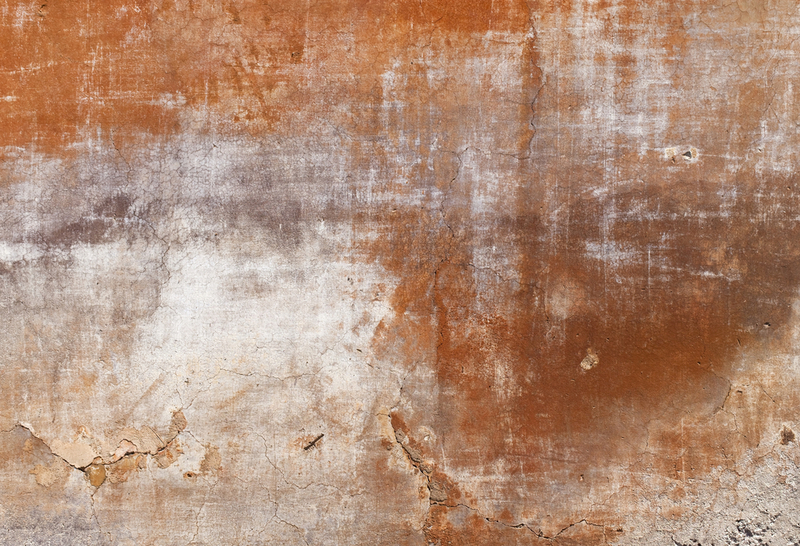 Many scholars, including Joseph Campbell and Jung, noticed the ‘missing’ feminine link — in Western religions especially. They also noticed that this link was present in ancient traditions but had been edited out then reinterpreted when misogyny was prevalent in Biblical times. They also noticed that the same archetype of the Dark Cosmic Goddess as the great Creatrix of not only humans but also the Resurrecrtrix of gods has been told repeatedly in all spiritual traditions. It is the same story but with different names. More recently, some researchers, with Starbird the most famous, have pointed to Mary Magdalen/Magdalene as the latest manifestation of this archetype. In the end, I am not saying that we should believe or disbelieve this story, the story of the powerful and mysterious Cosmic Goddess, the feminine we long for and want to manifest. I do believe, however, that perhaps we should take notice of the goddess who was edited out of history but has managed to resurrect herself through the ages, hiding in plain view as the Dark Madonna, with the uninitiated believing her to be the Virgin Mary while the ones who know the ancient truths recognise her as the Cosmic Goddess, in her most recent incarnation of Mary the Magdalen. I would love to know your thoughts about this. Also, there is much to this story which I could not cover in one blog. But if you are interested, there is a great deal more, including tales of the Templar and some other wonderful ‘conspiracy’ stories. Please let me know in your comments if you want to know more. This entry was posted in Goddess News and tagged archetype, Black Comsic Goddess, Black Madonnas, Cosmic Goddess, Creatrix, Dark Cosmic Goddess, Dark Madonnas, Divine feminine, Dr Joanna Kujawa, Goddess, goddess archetype, Goddess News, Goddess News blog, godesses, Godesses of Sumer, Gpddess News newsletter, Hieros gamos, Hierso Gamos, Ishtar, Isis, Jerusalem Diary, Jospeh Campbell, Journaling to Manifest the Lost Goddess in Your Life, Margaret Starbird, Mary Magdalen, mary magdalene, Mother Goddess, Ninmah, Other Goddess, Resurrectrix, Serian Goddesses, Spiritual Detective, Sumerian creation story, Wedding at Cana. Bookmark the permalink. This is a fascinating topic for me. I absolutely would like to hear more on the conspiracy stories. This was really interesting. I would like to know more. Thank you my gorgeous friend. I am so glad you connect to this 😊. I was a bit nervous because it is a bit radical stuff but it is also so fascinating. More and more, I find the evidence and hidden clues that we are not told the whole story and that we need to unearth what we can and re-write the story of the Feminine Divine and our Divine origins. Much Love. PS I will be in Brisbane to be a part of documentary film soon so if time permits perhaps we could catch up for a snack? Ever heard of Acharya S/DM Murdock – she has several books and videos about all of this type of info as well. 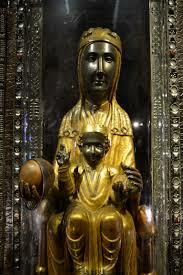 Fantastic exploration of the origin of the Black Madonna (of Czestochowa) . wouldn’t the good catholics of Poland be surprised! We are collectively searching for the new myth, the old forms are crumbling, Joseph Campbell alludes to the ungrounded impulse that has been birthed through our obsession with ascension and ascending to the light, as a distortion of the true meaning of the Christian myth. The damage created by the absence of the Sacred feminine principle and our obsession with rising ascending as a male principle is present in the destruction of our environments and the devaluation of human life and the sublimation of women. To descend is to go down, down into the mud bloody ooze. down into the messy shadowy underworld. mindful the strength of the shadow grows, the closer we are to the light. Thanks vor allem your words. A new Insight vor me. I like, nö i love all your reasonable explanation. I am overwhelmed. Thank you for this wonderful blog post~!! I would love to learn more about the conspiracy stories. Thank you~!! Thank you, Adriana. I will definitely share more of the conspiracy theories. 😊 I like to introduce them in stages as they might be too much for some readers but I love them too.